The hugely successful franchise, with manga, anime and live action versions, continues with this computer animated film. When Kato is killed in a subway stabbing he appears in a mysterious apartment room with a giant black ball in the centre. The set-up will be familiar to those who have seen previous instalments in the series, and this film cuts straight to the action. The Gantz ball sends Kato and his team, model Reika, Suzuki, young boy, to Osaka to take on the terrifying aliens that have invaded. These take the form of various creatures of Japanese mythology. There the team meet with their Osaka counterparts, led by a cocky trio of men, and a young woman Ayumu. “Gantz: 0” is directed by Yasushi Kawamura, from a screenplay by Tsutomo Kuroiwa, and this latest episode essentially retreads familiar ground, while attempting to go one better on the action and excitement of previous installments. Hiroya Oku’s manga has been adapted a number of times, most of which follow the same story, or at least the first part of the manga series. This film takes the action to Osaka, an idea developed in a spin-off manga series. The decision not to spend to much time on explanations, which would be meaningless exposition for most fans, plays to the film’s advantage. Instead we are given a new set of characters and get straight to the battle. The animation is spectacular and allows for the sequences to get as crazy as both manga and anime versions, with incredible creations for the aliens, and the use of various technologies seen later in the series’ such as the bikes and upgraded weapons, even a gigantic mechanized suit. It is great to see Osaka recreated affectionately here, and places such as Dotonbori feel realistic. The film takes place almost entirely in this location and it is clear the animators put a lot of effort in to the sets, with plenty of background detail. The characters are as interesting, though understandably given little time to develop. 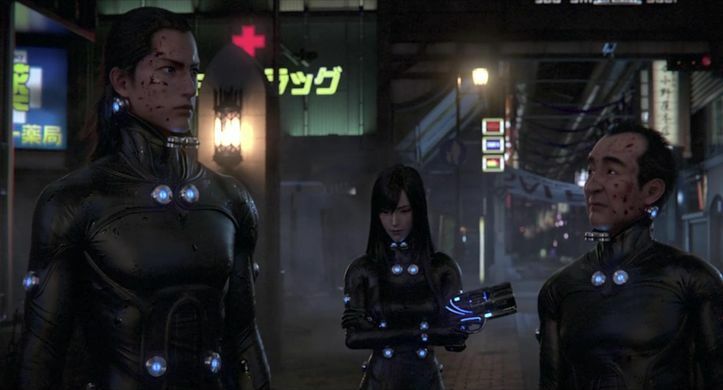 The Gantz franchise has always delighted in giving its audience, primarily young men, exactly what it wants, fully embracing the low-brow exploitation angle, while at the same time being excellent at telling a story full of intrigue. This film has all the usual elements, exciting fight sequences, monsters, beautiful female heroines, and a dark tone enlivened by its more peculiar comedic elements. The central concept of the story, of people battling impossible odds is there. There is certainly meaning behind the madness and it could be argued that this is the ultimate exploration of a trend towards extremes. It involves so much of Japanese culture and mythology you can feel it bulging at the seams with interpretations, though it rarely stoops to explaining itself. It’s heroes are archetypical and the struggle against villains as a timeless story that has been expertly updated by this series. This film is sure to please fans of the franchise. It adds little in terms of developing the series, but fits perfectly in the cycle and gives exactly what fans might hope for.